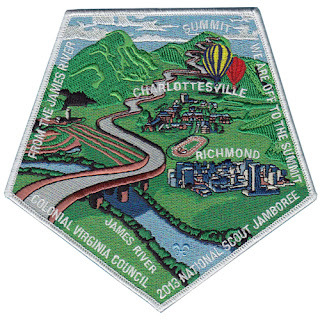 Following the lead of many other Scout councils across the country, Colonial Virginia Council has issued a multi-part patch set for the 2013 National Scout Jamboree to be held July 15-24 at the new Summit Bechtel Reserve at Mount Hope, WV. The set is comprised of a pentagon-shaped center patch flanked by 5 Jamboree Shoulder patches. Two of the JSP's are trader issues and picture an F/A-18 Hornet fighter jet taking off and returning from an aircraft carrier. Jamboree Troop A406's shoulder patch features a whitewater kayaker, while Jamboree Troop D312's shoulder patch depicts a Scout superhero fending off a fire-breathing dragon. The fifth JSP is for Jamboree staff and shows the New River Gorge bridge near the Jamboree site along with a map of the area served by Colonial Virginia Council. The center patch depicts the journey from the council to the Summit. You can view all of the Jamboree Shoulder patches issued by Colonial Virginia Council since 1993 on the CVC JSP page.